She appeared lifeless as she lay on her side, despite the best efforts of the factory workers who found her, and who tried to see if coaxing her with food would stir her. 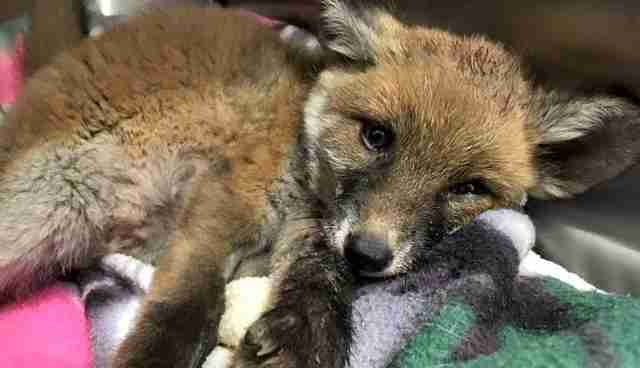 When those attempts failed, Paul McDonald, a local fox specalist with Freshfields Animal Rescue in Liverpool, was called in. 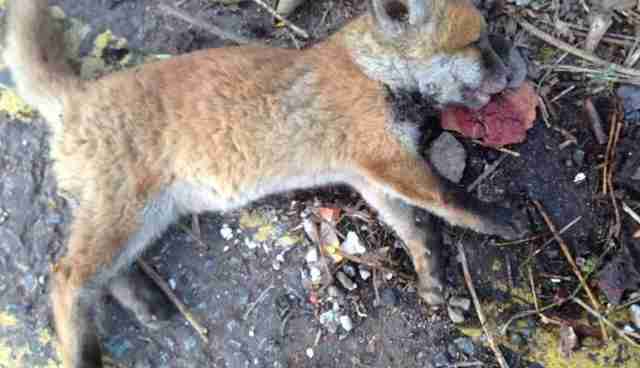 "I'd seen it all before - foxes like this usually don't have a happy ending," McDonald told The Dodo. He contacted a trusted veterinarian at Parker Crowther Vets, explaining that, while he didn't expect Red to survive, if anything could be done for Red at all, with her very faint heartbeat and breathing, he was willing to cover the expenses. "I use this particular vet, as I know she will try her best, unlike some vets who aren't that interested in wildlife, as there's no money to be made," McDonald said. "As luck would have it, I was proven wrong in my initial assessment," he said. "Red's breathing and heart rate was normal. There were no signs of any fractures." However, Red was dehydrated and had a low body temperature. She was immediately placed on an IV drip and given antibiotics, and started her journey to recovery. After spending a few more nights at the vet, Red arrived at Freshfields Animal Rescue. While Red was actually able to move at that point, she was still too weak to fully stand up and walk. "I still had to feed her using a syringe for a couple more days," McDonald said. "But one night when I went into the unit to feed her, Red stood up on her own, which I admit brought a tear to my eye. To see this poor animal, who I was convinced was not going to survive, show a miraculous turnaround changed my outlook on rescues of this nature, which normally end in tears of a different kind," he said. Within the following days, Red started to walk on her own - her footsteps a bit wobbly, but nonetheless reflective of her determination to get better soon. 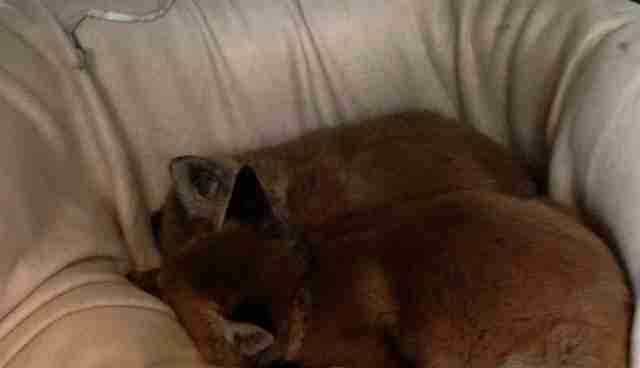 Another fox cub arrived at Freshfields in the midst of Red's healing. 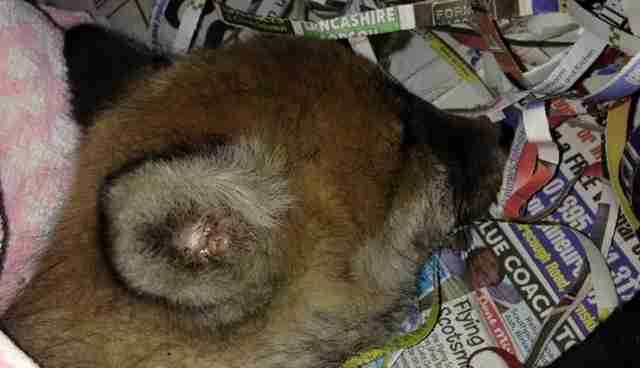 He was found alone behind a shed in Wirral and given the name Bruno. "As Red and Bruno were around the same age, they were ideal to mix together - and took to each other very quickly," McDonald said. "Fox cubs are very sociable animals and it's important that captive ones are not kept alone, as they can either become tame or get lonely from having no company. So it was a great relief to be able to give Red a friend in the form of Bruno," he said. 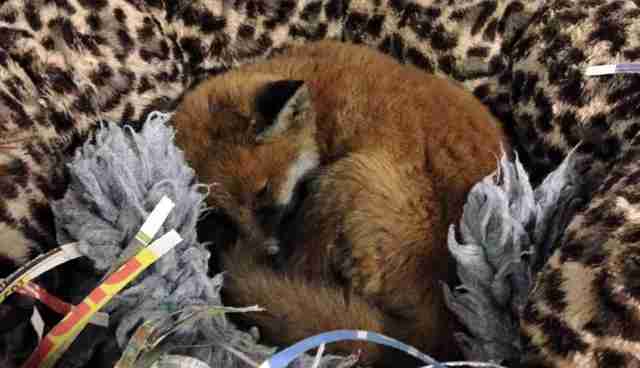 Now the two are thriving and pretty much run the rescue's fox unit together. McDonald said that, within the next few weeks, the two will get a "soft release." That means Red and Bruno will be set free within an outdoor enclosure, given the opportunity to explore the sights and scents of the wild while within the safety of the pen. Meals will be provided for them for a few days until they gather their bearings and become comfortable enough to hunt on their own - and eventually, live on their own. "If any more orphaned cubs around the same age as Red and Bruno come in, I will be mixing them in with them also, up to a group of 5, and they will all be released together, where they will then disperse and find their own territories," McDonald said. You can keep up with Red and Bruno on McDonald's Facebook page, The Fox Man. Want to help Freshfields Animal Rescue continue doing good work? Consider making a donation here or sponsoring an animal here.